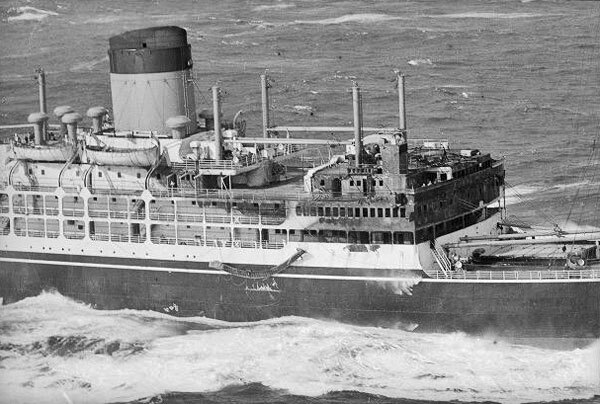 During the night of 1 August 1968, four days after leaving the New Zealand port of Bluff bound for Liverpool, the 15,911-ton British cargo liner SS Gothic suffered a fire which killed four passengers and three crewmembers. At the time of the fire, Gothic was steering into a gale, 1802 miles east of Bluff, at approximately 44°24’S, 149°04’W. It was 2.30 in the morning when the automatic fire alarm sounded on the bridge, and a cadet was sent to investigate. He discovered a small fire in the officers’ smokeroom, but was unable to get the nearest firefighting cabinet open. He got a fire extinguisher from another deck but it failed to operate properly. By this time the fire and smoke were spreading to the bridge, radio room and cabins where six of the seven victims were sleeping. Roused from his cabin, Captain Brian Hilary Agnew turned the ship downwind using engine commands relayed by another crew member to the engine room (the ship’s steering and engine telegraph were disabled by the fire). 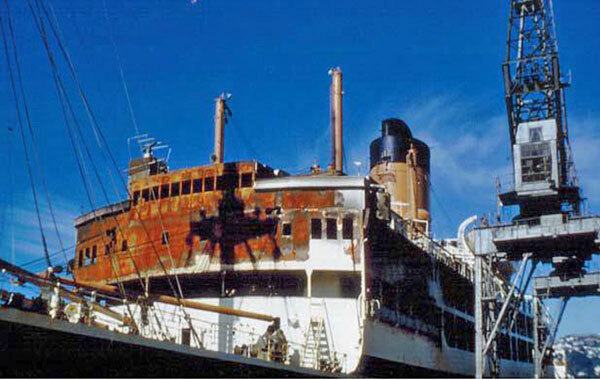 The Gothic’s crew then fought the fire from behind – on three decks – taking some three and a half hours to extinguish it. 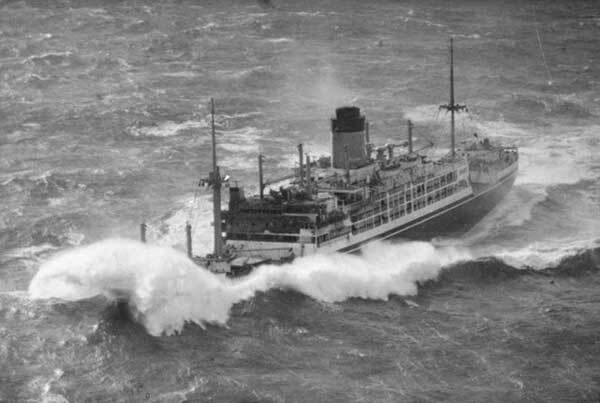 Captain Agnew navigated Gothic safely back to New Zealand under her own power – even though the fire had gutted the bridge, radio room and parts of the accommodation, and the ship had to be steered from the stern using an emergency compass with unknown error. Gothic docked at Wellington, and was repaired sufficiently for the trip to Britain, although she was scrapped soon afterwards. For full details, see the Preliminary Report into the Gothic Fire. 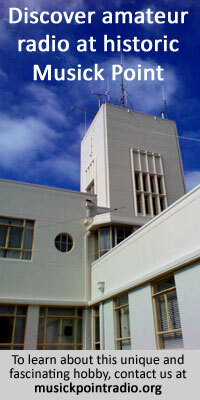 See also: Radio communication with SS Gothic and the many other subpages covering the Gothic disaster in detail. 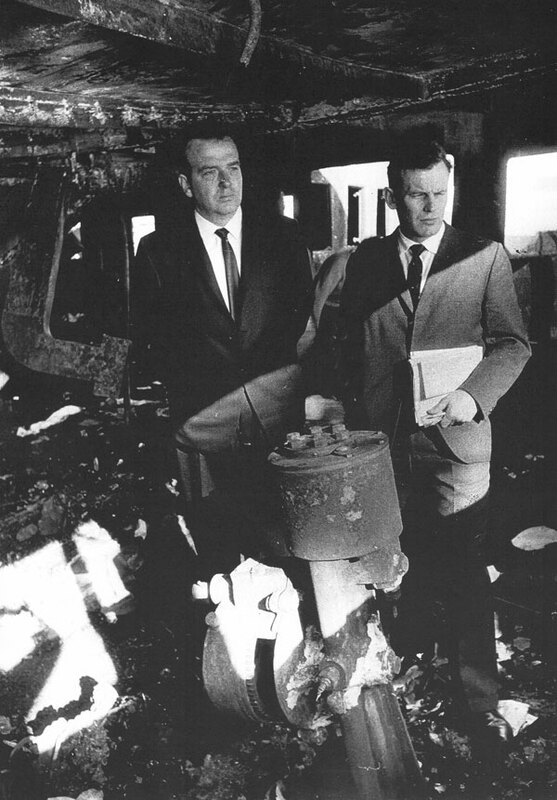 Captain Brian Agnew (right) and Chief Engineer John McKinnon on the burnt out bridge of Gothic.